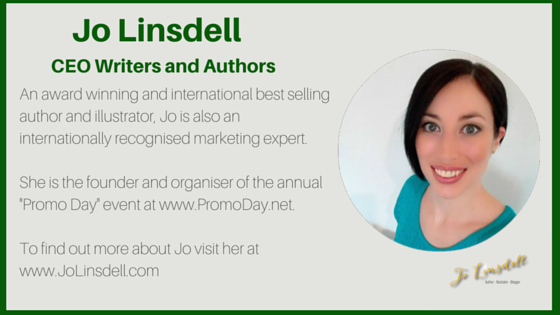 I write contemporary realistic fiction, which reflects the lives of tween girls, ages 9-12. Lots of kids who aren’t big readers tell me that they love my books, which really makes me so happy. While my books are great for reluctant readers, they work for avid readers as well. There’s plenty of dialogue and humor, but I always try to present an issue that will get girls thinking. I write for this age group because when I became a tween I suddenly lost my confidence. I went from being a fairly confident kid to someone who slipped into self-doubt. I thought--if only I were someone else, my life would be better. So no true! When you are your truest self, your best friends show up and you flourish. In my first book for tweens, Things Are Gonna Get Ugly, the main character decides that the only thing that matters is popularity and drops her interest in reading and school. She even cheats on tests. But through the book, she has a chance to redeem herself (there’s even a bit of magic in it a la Freaky Friday). In my second book, The Hot List, I address what it’s like when you’re in seventh grade and your best friend abandons you for another set of friends. My main character goes to crazy lengths to try to win her best friend back, which doesn’t turn out as planned. 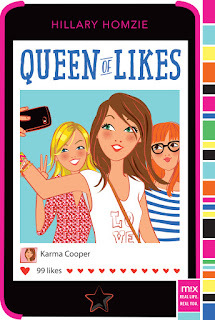 My latest book, Queen of Likes, comes out this month so I’m going to go ahead and throw some confetti right now. It’s probably my favorite book (okay, my newest books are always my favorites lol). It’s about tweens and social media and how it can go very wrong. I’m the parent of two teens and a tween so I know about this--really and truly. Here’s a summary of the book: Like everyone at Merton Middle School, Karma Cooper’s smart phone is almost another body part. She's obsessed with her likes on Snappypic. Karma attends a classmate’s bar mitzvah and when she is called up to sing, she’s in the bathroom on her phone (well, what else do you do in the bathroom?). 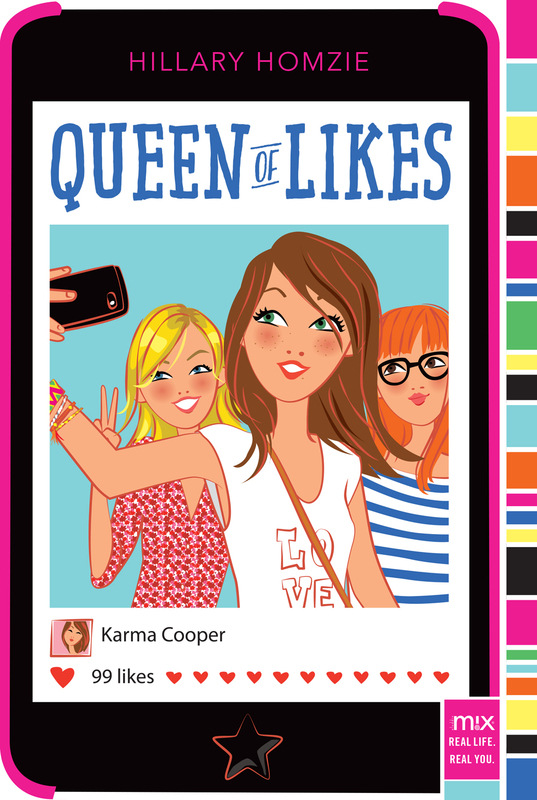 When her parents shut down her social media account and take away her smart phone, Karma’s whole world crumbles. She has to figure out what she actually likes and how to live life fully unplugged. Ultimately, Karma ends up learning to do something because she LIKES it versus what others think. Set in the suburbs of Portland, Oregon, this middle grade novel will jumpstart conversations about how social media is changing the way in which tweens are growing up. I’m so glad you asked that. I figured since it’s a book about social media—well, I definitely had to use social media in order to promote the book, right? My son, the singer songwriter Ari Eisenberg (of the band Secure the Sun) wrote and posted an awesome song on Soundcloud called, well, Queen of Likes (https://soundcloud.com/ari-eisenberg/queen-of-likes). Also, a very talented young videographer, Cameron Lovie, made a book trailer, which can be viewed on Youtube (https://www.youtube.com/watch?v=dDoojO03TVg&feature=youtu.be). I also had young teens film themselves showing what they like to do. Those shorts will be posted on Youtube during the months of April and May. Jane Austen, Madeleine L’Engle, Clare Dunkle, Judy Blume, Gail Carson Levine, Shannon Hale, Jaclyn Moriarty, Rainbow Rowell, Paula Danziger, Richard Peck, Paul Zindel, Susane Colasanti, Sarah Dessen, Cecil Castellucci, Louise Rennison and so many others! Write what you would to read! Don’t write what you think you should write. If you enjoy guilty pleasure books, write one. If you love mysteries, write one! Write about what gives you joy. Write regularly and read a lot! Revise, revise, revise, and create a supportive community for yourself by joining writers associations. In my field (children’s books) the go-to group is the Society of Children’s Book Writers & Illustrators. They can help you locate critique partners. Also, consider taking some writing classes. Naturally, I highly recommend programs where I teach—Hollins University Summer Graduate Program in Children’s Book Writing & Illustrating (https://www.hollins.edu/academics/graduate-degrees/childrens-literature-graduate-program/) as well as the Children’s Book Academy (http://www.childrensbookacademy.com) which is an interactive, online site. Well, I will have to use a quote Pulitzer Prize winning author Annie Dillard as she’s a graduate of Hollins University where I teach. 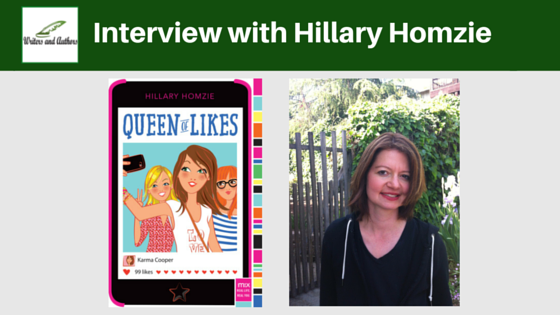 At my website hillaryhomzie.com, they can follow me on Twitter @HillaryHomzie and like my new Facebook author page https://www.facebook.com/Hillary-Homzie-97371546051/. I actually became obsessed with Twitter for a few months and, suddenly, I understood social media addiction in a whole new way. For a long time, I resisted social media. I think I worried it would take away from my writing time too much. I remember my sister Leslie was on Facebook for months before I joined and started a personal page. For years I had Twitter but wasn’t active on it as it seemed so mysterious to me. But since my protagonist, Karma Cooper, is a social media aficionado, I figured in order to completely get her I had to be one too. Finally, I embraced Facebook and joined a bunch of wonderful groups (some author communities) and I really am enjoying the camaraderie. Same thing with Twitter. I was even able to speak with one of my writing heroes, Judy Blume, through a Twitter chat. Now I’m a believer. However, for a bit, I got a little too obsessed and was compulsively checking it all the time and it was interrupting my work flow. But I’m so grateful I plunged in as now I feel as if I fully understood the good, the bad and the amazing part of social media! I’m probably running my kids around to various activities, cooking dinner, speaking with a critique partner, checking emails, on social media, playing social secretary and trying to figure out my kids schedules, reading a Hollins University MFA creative thesis, tidying up the house, talking my giant labradoodle out for a walk, on the elliptical at the gym, or reading a book and not in that order. I do try to sleep every night, although when I was younger I would forgo that when on deadline. But these days I find I really do need my sleep. I don’t write well in a zombie state. I do try to take the time to give gratitude and thanks every day! In northern California, exactly where I live now. I know that sounds lame but I love it here! I really enjoyed the interview and it hit home in so many ways. Thanks, Rochelle! Our kids are definitely having a very different childhood experience. It some ways better, in some ways more challenging. So happy to do so, Victoria!